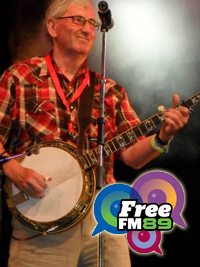 Back Porch Bluegrass is an hour long bluegrass show on Hamilton FreeFM or podcast. It’s also a blue grass club usually held on the forth Sunday of the month 2.30pm – 5.00pm at the Silverdale Normal School Common Room, Silverdale Rd, Hamilton. However check eventfinda or listen to Paul’s radio show to find out if it is on, before you hop in your car and head over there.